With the high tensile force, Compact creates a tighter and more rounded shaped bale. This allows better stacking and transport. The additional film layers of Compact will increase the mechanical protection on the round side of the bale which will greatly support the handling and storeage of the bales. Furthermore the oxygen barrier is much improved by the additional film layers which will optimize the fermentation process and also assist in reducing the loss of fodder due to mould. 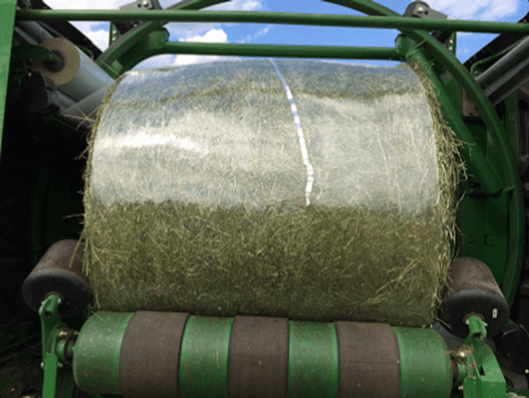 Because Compact and all silage wrap films are made from the same material, there is no requirement for separation between film and netting on bale opening. Using Compact instead of netting will allow your bale protection films to be recycled together. Remains of net in bales after opening can be avoided. Due to the high level of transparency of Compact, when used with Agristretch Crystal wrap you are able to reach a perfect see through bale which will allow you to control your bales more efficiently.